Technology consumers are often categorised based upon how quickly they will adopt a new piece of technology. Early adopters are often coveted and praised by manufacturers and retailers. These early consumers take the risks and costs associated with new technology to experience firsthand the new product or service. 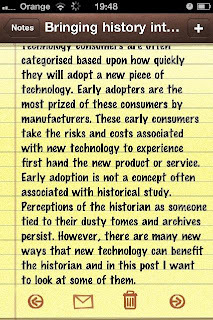 Early adoption is not a concept often associated with historical study. Perceptions of the historian as someone tied to their dusty tomes and archives persist. However, there are many new ways that new technology can benefit the historian and in this post I want to look at some of them. This blog post is being written from my phone. I'm not trying to do this as a gimmick. Last month I composed large segments of my last thesis draft chapter from my phone. The experience I admit wasn't flawless, but having the opportunity to note down inspiration anywhere is a great aid in improving the efficiency of your workflow. However, the particular appeal for me was that I could, through my phones internet connection, then synchronise my notes with my laptop. Several ways exist to do this. My phone automatically associates with my googlemail account, but for those without googlemail an excellent application (small computer programs designed for Smartphone’s and downloadable from the phone) called Evernote does the same job. The ability to reverse the process is also a nice additional touch. I am therefore able to copy whole thesis chapters to my phone that can be read and edited in the same way. This means that I can quickly and easily work almost anywhere. Many of you may be concerned that using a phone to edit large pieces of work is a recipe for disaster. Let me say then that mobile based work will not replace the work done in the conventional way. Although screens are getting bigger they are still only capable of showing a fraction of a pages work. The touch screen and texting interfaces can be unwieldy for some especially those that don't text often. A more general concern would be that the small space and texting style input might impact upon work quality. However, it could be argued for many writing academic work, that they could do with shortening and simplifying their sentences. Artificially restricting the interface via a small screen might be a helpful tool for some. Though this may help working on the go should not replace the bulk of work done via traditional means. The real appeal remains being able to work almost anywhere that is comfortable for the historian. Especially in the creative side of writing this may not be sat at a desk in front of a computer screen. Having the option and freedom to work as inspiration takes you is a useful resource. How many of us have been frustrated and/or bankrupted by printing unwieldy computerised journal articles? Expensive to print, hard to read on screen the journal read electronically is not an easy to use historical resource. Recent developments have allowed the historian to read and annotate journal articles anywhere. Again mobile phones and tablet PC’s are the medium for this. On the iPhone and iPad you can do this via an App called papers which allows you to search journal hubs such as Jstor for articles to download to your device. These articles on the iPhone can be read and notes made via the iBooks app. On android phones, several comparable PDF readers exist doing a similar job. The flexibility of e-journal reading is only magnified when articles are downloaded to eBook readers such as the Nook and Kindle. For adherents to Apple the iPad does a similar impressive job but at an admittedly high cost of entry. As these devices take off in popularity The ability to have all your favourite and useful journal articles anywhere will be a real aid to their use. For many this development will ease the pain and annoyance of reading articles on a desktop screen which is often prohibitive to good historical work. All of us have heard of YouTube and some of us have even posted to it. It's an anarchical open space for posting videos but until now has not been very useful for supporting serious academic content. 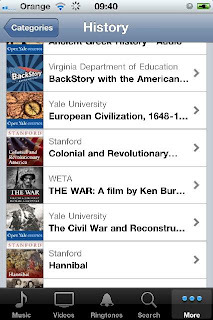 However, the introduction of iTunesU which is available to all has opened up a wealth of possibilities for historians and institutions. The concept is simple. iTunesU which is available for free from the iTunes store (free to download) allows institutions to upload video and audio recordings of lectures, debates and seminars for others to access. Many institutions are using it for marketing purposes but it has potential to provide a whole new source of secondary debate for the historian especially for inaugural and conference lectures that highlight new research. Currently it needs some standardisation to allow it to be used as a source. URL's generated by iTunesU are static but hard to use and the alternative of using the date of the talk or paper as always proves difficult to quantify. However, as the site is increasingly used by good historians and institutions it has the potential to add a completely new resource for the debate and understanding of historical research and thought worldwide. Once it reaches a tipping point and more dynamic content is added it will go from a useful tool for academic media to a vital tool for the quick dissemination of historical data. When looking at the work of organisations like the TED conferences (http://www.ted.com/) which invite world experts to discuss new ideas at two annual conferences and then upload these special talks online daily the potential is there for history as a discipline to do something similar. Perhaps we'll see a lecture or two by our own Leicester academics in the coming years? That is the end of this introduction to the major developments in technology that I believe will help the historian to be more dynamic and flexible going into the 21st century. As new apps, technology and platforms become available I will try and introduce them via the blog for you. Until then, I’d like to hear any thoughts you have about the ideas presented via the comments section below?